QuickBooks performs all the necessary calculations and generates the balance sheet for you. Keep an eye on your business’s financial health. 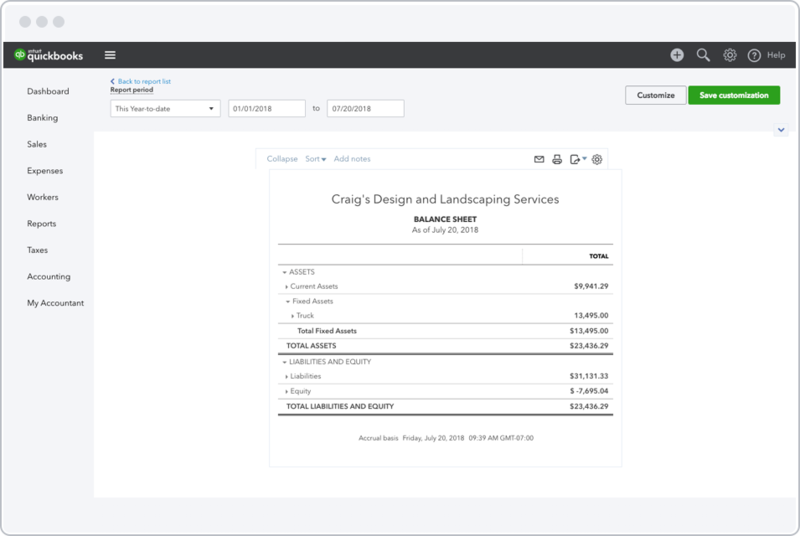 Because QuickBooks tracks and organizes all of your business’s accounting data, it’s easy to access your balance sheet and other financial statements. QuickBooks does the appropriate calculations and generates the balance sheet for you, providing you with a snapshot of your business’s financial health. The balance sheet provides business owners with a snapshot of what is owned, what is owed, and how much the business is worth. QuickBooks makes it easy to regularly review your balance sheet in order to spot the strengths and weaknesses in your business, helping you to make smart decisions about how to invest and grow in the future. The balance sheet is the core component of other financial statements, as all other statements either feed into or are derived from the balance sheet. With QuickBooks, you can generate over 50 accounting reports and financial statements in just a few clicks. It’s easy to share reports with your business partners, investors, or colleagues. You can even schedule them to be automatically generated and sent daily, weekly, or monthly. The balance sheet details what a business owns (assets), what it owes (liabilities), and its net worth (ownership equity) at a specific point in time. It is organized into two sections that must balance, thus the reason it is called a ‘balance sheet.’ In the simplest terms, it subtracts what you owe from what you own to calculate what the business is worth. The balance sheet, together with the income statement and cash flow statement, are the central financial reports for any business. The balance sheet can help you identify trends in your business, especially in the area of accounts receivable and accounts payable. Are your customers paying your invoices? Do you have bad debt (debt that is unable to be collected)? Are you able to pay your bills? A thriving business has assets that are greater than the sum of its liabilities. This creates value in the company’s equity or stock, and opens up opportunities for financing. Banks and investors commonly use the balance sheet to review a snapshot of a business’s current financial state and to evaluate its worth over time. More than the balance sheet. Run your entire business with QuickBooks. Are you looking for a loan to help grow your business? QuickBooks Capital can help. We use the data you already track in QuickBooks to calculate your financial position for potential lenders. We pre-fill your loan application, send it to our trusted partners, and notify you directly of a decision. Sales tax is a fee charged by government agencies, and in order to collect it, your customers pay the tax to you and then you are required to track the taxes payable to each agency and pass it on by making tax payments. QuickBooks makes this process easy by calculating and tracking sales tax for you. QuickBooks automates standard bookkeeping tasks such as entering transactions, performing calculations, and organizing data, making it easy to run accurate financial statements like the balance sheet. QuickBooks automatically backs up your data to the cloud and syncs across all your devices. Current assets, current liabilities, retained earnings, and shareholders equity are common terms related to the balance sheet that you should know. We put together a guide to help you understand the ins and outs of the balance sheet. The biggest mistake made on the balance sheet applies to classifying assets and liabilities. There are current liabilities and long-term liabilities, current assets and long-term assets – all of which must be properly classified. Read more about errors that tend to appear on financial statements. On a balance sheet, ‘long-term assets’ are assets that cannot easily be converted to cash within one year, and include intangible assets such as trademarks and patents. These make up part of your business’s total assets. We break down the components of the balance sheet here. How is a balance sheet used in a business? The balance sheet is an important financial statement for business owners. It summarizes your company’s financial health on a specific date. It can help you answer important questions such as whether your business can continue to fund its own growth or should seek financing. The balance sheet helps you evaluate the equilibrium between your company’s assets and its liabilities to determine the overall financial strength and value of your business. How do you know if your balance sheet is correct? The balance sheet is organized into two sections that must balance. If they do, you can feel secure that your balance sheet is correct. Here is the important equation: Assets = Liabilities + Owner’s Equity. If your assets equal your liabilities and owner’s equity, then your balance sheet is correct.